For the second year in a row, TMX Communications of Conshohocken, PA was recognized with the 2006 Top Agency Award, winning 13 IAC Awards. Their awards included 12 Best of Industry awards and an Outstanding award. Last year, TMX Communications shared the Top Agency Award with Organic, Inc. The 2006 Internet Advertising Competition is sponsored by, BURST! Media, Small Army, AdTools, ExactTarget, OddCast, Line56 Media, and PRWeb. The Web Marketing Association is currently accepting entries for the ninth annual WebAward Competition for Web site development at www.webawards2006.org . Deadline for entry is May 31st. announced in a few days. The Web Marketing Association is pleased to announce the call for entries for its 10th annual international WebAward competition. The WebAwards is the standards-defining competition that sets industry benchmarks based on the seven criteria of a successful Web site. It recognizes the individual and team achievements of Web professionals who create and maintain outstanding Web sites. The deadline for entry in the 2006 WebAwards is May 31, 2006. A complete list of past winners and this year’s entry form can be found at www.webaward.org. Using the quantifiable data collected from nearly 10,000 Web site evaluations over the past decade, the WebAwards has defined and recognized industry-specific benchmarks for successful Web sites in each of these areas and release a the Internet Standards Assessment Report to communicate the findings of the study. A copy of the study is available at www.webaward.org. * A “Best of Industry” WebAward, a handsome plaque with the image of the winning site embossed, will be given in each of the 96 industry categories, including financial services, medical, small business, travel, advertising, transportation and government. New categories for this year include Blogs, Architecture, Electronics and Photography. * The competition’s highest honor, the 2006 WebAward “Best of Show”, will be given to the one site that the judges believe represents the pinnacle of outstanding achievement in Web development. Last year’s Best of Show winner was based IQ interactive (www.iqtv.com), for their outstanding work on “National Geographic – Inside The Mafia” at URL www.insidethemafia.com. * The Web Marketing Association will also recognize the interactive agency winning the most awards in the competition with the “Top Interactive Agency” WebAward. The 2005 Top Agency award was presented Zugara (www.zugara.com), taking home 20 awards, more that any other organization in the history of the competition. Judging for the 2006 WebAwards will take place in June through August, with winners announced in September. Judges will consist of a select group of Internet professionals who have direct experience designing and managing corporate Web sites,–including members of the media, advertising executives, site designers, content providers and webmasters – with an in-depth understanding of the current state-of-the-art in Web site development and technology. Mark Kingdon, CEO of Organic, Inc. has been selected to lead the judging panel this year. Past judges have included top executives from leading organizations such as Ogilvy Interactive, Saatchi & Saatchi, Blattner Brunner, Comedy Central, Sun Microsystems, Refinery, Euro RSCG, EPB Interactive, New York Post Interactive, The Cincinnati Enquirer, J. Walter Thompson, Xerox, Art Institute of Pittsburgh, Modem Media, and Answerthink. The 2006 WebAward Competition current sponsors include Burst Media, SimpleFeed, Register.com, NewsUSA, AdTools Inc, Small Army, Perseus Development Corp and PRWeb. Media Sponsors include Website Services Magazine, AdRants, MarketingVox, MediaPost, eComXpo, Ad:Tech and Macworld. The Web Marketing Association thanks all of its sponsors for helping to make this annual competition possible. The 10th annual international WebAwards competition sets the standard of excellence in 95 industry categories by evaluating Web sites and defining benchmarks based on the seven essential criteria of successful Web site development. The goal of the Web Marketing Association, sponsor of the WebAwards, is to provide a forum to recognize the people and organizations responsible for developing some of the most effective Web sites on the Internet today. Entrants benefit from a Web site assessment by a professional judging panel and the marketing opportunities presented to an award-winning Web site. For more information, visit www.webaward.org. * The competition’s highest honor, the 2006 WebAward “Best of Show”, will be given to the one site that the judges believe represents the pinnacle of outstanding achievement in Web development. Last year’s Best of Show winner was based IQ interactive (www.iqtv.com), for their outstanding work on "National Geographic – Inside The Mafia" at URL www.insidethemafia.com. sponsors, including Ask, Google, Microsoft’s MSN Search and Yahoo!. 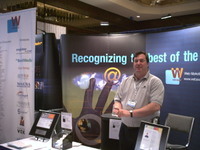 Vistit us at booth #406 and learn more about the 2006 WebAward competition. is now open at www.ecomxpo.com. PRWeb, a sponsor of the 2006 WebAwards, has created a podcast interview of William Rice, President of the Web Marketing Association, discussing the major finding of the recently released Internet Standards Assessment Report (ISAR). Entitled "Breakthrough Internet Study Sets Benchmarks for Web Site Development " the podcast is currently live and is listed on the main page under "Most Recent Podcasts" and in the "Most Recent Podcasts" RSS feed. It can also be found under the approriate iTunes category feeds on this page (http://prwebpodcast.com/podlist.php). Save 20% by registering with our promotional code: ATSFEG. Visit us at booth #5751 and learn more about the 2006 WebAward competition. criteria of a successful Web site. many sites that would normally not be available to us". efforts of the Web Marketing Association and the WebAward program."